Diana Cenat is a writer living in New York City. By day, Diana works as an internal coordinator at media company Refinery29. 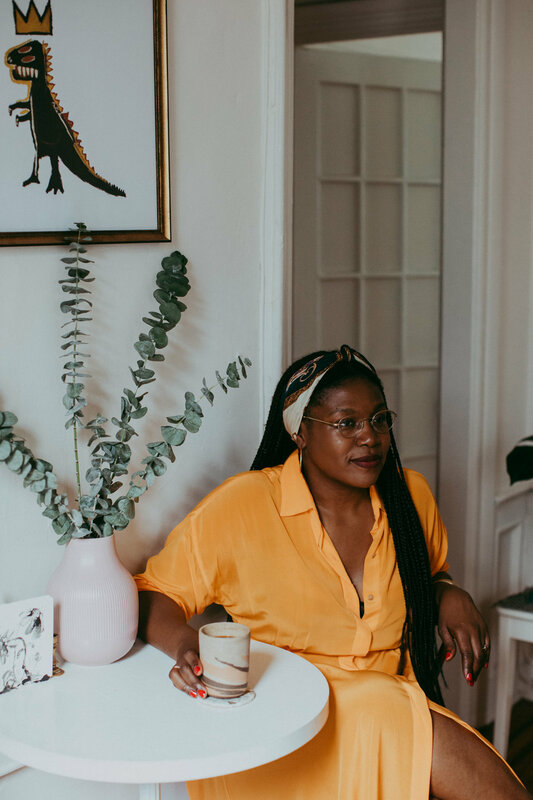 By night, you can find her writing for publications and for pleasure, co-hosting the Wing book club at the Dumbo location, or giving the world a really funny, adorable, and spirited tour of her (old) apartment. She still gets emails about it! We totally get it– Diana is the kind of human that we all hope to have as a BFF, or at the very least, a pen pal. Smart, kind, thoughtful. Warm. Unpretentious. Hilarious. Diana Cenat: The Baby-Sitters Club was a huge, huge thing for me growing up. We used to get those Scholastic Magazines during the school year in Queens. You would take them home and beg your mom to get you whatever the book was or whatever the set was that you were dying to read. I always went for the set. I was like, “I don't have time to waste!” I'm not trying to get one book and read it in a week. I want the set so I can save myself until the next Scholastic Magazine comes out. And then going to the fairs at school and being like, “I just need $10 please.” Which to you is nothing, to your mom is like, “What are you talking about? You don't pay any bills, but okay. You're reading, its fine.” So The Babysitters Club was my set of choice. GAL: Out of all the members of The Baby-Sitters Club, who did you identify with the most? Be honest! DC: Honestly, I wanted to be Stacey. I also wanted to be Claudia. Since Stacey was from New York, I would try to do the thing where I mentally mix them together to create a character that mirrored myself. So I'd be like, well Stacey's from New York, but also Claudia is the first generation like me, so maybe I'm the two of them? But in reality: no. I’m Mary-Anne. GAL: [laughs] I think we all want to be Claudia. I know I do. What other books do you remember from early years? DC: I also really loved The Animorphs. So when I was reading The Baby-Sitters Club, my brother was reading The Animorphs. I would read his books, he would not read mine, he was not interested. GAL: Bad decision. He missed out. DC: [laughs] So, The Animorphs shaped a lot of the ways I see the world. The books revolve around these five kids who are thrown into saving humanity from an alien race that slides into brains to take over a person. That person then becomes the host and helps the aliens on their mission to take over the world and drain resources. GAL: Interesting. That’s not really how it works anymore, is it? DC: No. Much in the way a lot of stuff, in the 80's and 90's, that kids were just allowed to access. They read what they chose to and saw all these things that parents today would probably forbid. GAL: Helicopter parents ruining lives every day! DC: Barracoon by Zora Neale Hurston. Every page floors me. Between how she captured dialect and the fact that she didn't change it at all. I read a little about the book before I started it and learned that her mentor told her to never change an interview and to keep, I guess, the potency of it, for lack of a better word. So she doesn't change the dialect at all. Hurston interviewed this man who was enslaved 50 years after trans-Atlantic slavery was supposed to be abolished and illegal. He was brought to the United States, and he's one of the last slaves alive when she interviewed him in 1927. She spent a long time visiting him and trying to get him to talk to her, but a lot of the times he wasn't up for talking because why would you be? By 1927, I think she started getting him to open up to her. She basically just recounts his story in Barracoon. I think it's because you're reading it in his dialect, you're almost transported. And it is beautiful and horrifying and devastating, but it's wonderful. She's amazing, and I can't stop. I'm also reading Human Acts by Han Kang. But the two of them are so engrossing and visceral. I realize that I tend to be very, very moved and very ready to read books that are very visceral because I can only do anticipation and anxiety in book form. I don't like experiencing it in movies. I stopped watching horror movies in the movie theaters 15 years ago, and just in general, I think eight to ten years ago, because I just can't do it. GAL: What about them is unbearable? Do you find another way to see them? DC: My imagination goes wild enough as it is. I don't need to watch it. I can make this up in my head. I make it up all the time. The only thing I really watch now is Game of Thrones, but that's because I just love it so much. Everything else I read recaps about. I have shows that I love, like The Walking Dead and The Americans but I love them in writing form. Vulture is good at recaps. GAL: Interesting. But you can stomach Game of Thrones in visual form? DC: I don't know. I started watching Game of Thrones, and I didn't really know anybody else who was watching at the time, if you can believe it. And I had one friend who was watching it, but he was way ahead of me. And I had been reading about it on Vulture, and reading about it and reading about it, and I was like, you know what? You just need to watch the show. So I was watching it on my phone, in the dark, by myself. That's how I was watching it when I first started watching it. And now I wonder how I even did that. But I still watch it. GAL: You’re brave. I can’t watch it. What other books ignite your emotions so deeply? Besides Barracoon and Human Acts. DC: Well, 2018 has been about family and tracing their history, and learning about the lives that were lived before you that are the reason that you're here now. In January I read Nadja Biegelman's I'm Supposed to Protect You From All This, which I feel like I talk about every single day now. It's Art Spiegelman's daughter, the famous comic who created Maus. The memoir is about her relationship with her mom, Francoise, who is the art director at The New Yorker. Nadja delves into all the things that happen in a relationship. Familial relationship, any kind of relationship, and all the little things each person extracts from that, and all the ways they turned that into a truth that may not be true. And how those truths or untruths can shape the narrative about the way they see the world. GAL: Did your perception of truth shift throughout the book? DC: Yes. Nadja begins the book talking about how much she loves her mother, and how much her mother is this force in her life. Then it shifts, and she talks about all the hardships in their relationship when she was a teenager. Then she delves into her mother's relationship with her mom, Nadja's grandmother. Nadja tells her mom, “I want to write about you. I want to write about your life. Tell me about your life.” So Francoise starts opening up to her, and then Nadja realizes that she couldn’t finish this story unless she spoke to her grandma. She moves to Paris to be with her grandmother, Josee, and just starts talking to her. She discovers that all these things Francoise told Nadja that shaped her life weren’t exactly true. Josee says, “Wait, that never happened, or that happened that way.” Or, “Here's my perspective about the situation, because I was going through this.” “And I never though that Francoise was unhappy. I thought she was ecstatic. I thought she was a really happy child.” I tried to find the absolute truth until a quarter of the way through the book. I realized then that I had to put my absolute thoughts about the truth and what the truth should be aside and understand that in this context it just doesn't matter. GAL: It’s hard to do that. So what shape does the truth take? Or what realization replaced that search? DC: The truth is less of a necessity than what it is done to these women and their relationship, and how they talk to each other and how they see each other, and how they see themselves. So, that kind of blew the cap for me where I was just like, “Oh my gosh. My mom, my grandmother.” And I just really wish my grandmother, either of them, were still alive so I could talk to them about their lives, and their versions of truth. GAL: Are there other ways to find the different truths of your history, your roots? DC: I took a trip to New Orleans, for the first time, with my friend Ashley Ford. Being there and being amidst all the culture that reminded me of my Haitian culture and family just kinda blew the lid open, again, for me. Particularly when we went to the Whitney Plantation that is the first plantation in the United States that's dedicated to slavery and talking about slavery. It was immersive and so...I can't explain how beautiful this property was and how horrifying it was, at the same time. I hope to never feel those two things like that ever again. DC: So, we were there and we end up talking to the guide. She was so smart and thoughtful and informative. She told us about how Haitian sugar cane was brought to this country, and that sugar cane helped make America rich. Sugar cane that was from Haitian slaves. She also pointed out that a white man had come from Haiti and claimed it was he who actually figured out what sugar cane could be and do. It’s not true. What he did was go get black slaves and black Haitian slaves and bring them here. I was like, “Oh wow, this is apart of my history, this is part of my own history” that intertwines Haitian with America in a way I never knew about and never really thought about. DC: Yes. So, I feel like I've spent the last few months really thinking about identity, family, and the truths and mythologies that we tell ourselves about our past and about our family. That theme has dictated what I choose to read lately. GAL: Why do you read? You’re explaining why you read what you’re reading right now, but what about in a larger sense? DC: [Laughs] I read because it connects me to the world and connects me to the parts of myself that are sometimes too hard to reach. Growing up, I read books that connected me to parts of the world that I have never visited, and don't know if I'll ever see. It’s all about a connection to the world that is eye opening and beautiful and activates empathy and understanding. You can always tell if a person is a reader. GAL: How can you tell? DC: It’s tough to have a conversation with them about the way things work in the world. They’re more closed-minded. GAL: Books open worlds. And some people don’t want to see other worlds. It’s so upsetting. DC: I do want to say one more thing in regard to my statement about people who don’t read. I grew up in Queens and there weren't really any bookstores. There were libraries and stuff, but there weren't really any bookstores. So, I say what I say before, not because I'm like, “Oh my God, read a book.” Some people just don't have access to books or the Internet, and I understand that. I worked at Barnes and Noble in high school and college so that’s a big way I had easy access to books. GAL: Do you remember discovering books at Barnes and Noble that formed you in a significant way? DC: It was around 2004 and I discovered Zadie Smith at the store. On Beauty had just come out in hardback. We had a little library in the back, and employees could leave the hardback covers and could borrow the book for a week or so. That began my love for Zadie Smith. I loved On Beauty so much. She’s such a nuanced writer. Her characters are never one-dimensional, stereotypical, or saying something only to further the plot. She’s still one of my favorite authors. GAL: Do you prefer now having a physical book or can you read on a Kindle or your device? GAL: Do you find yourself giving away, or getting rid of books a lot? Or do you like holding on to them? DC: I like holding on to them, but I don’t keep everything like I would when I was younger. I think it’s because I'm better at choosing books that I will love. Thought I don't know if that means that maybe I found my niche and I need to expand and get out of it. But for the most part, I feel like I find something that is relatable enough to where I am like, "I want to keep this around, even if it’s for research." 'Cause I hate when I've given a book away and then thinking of something in there that I want to re-read. GAL: Do you use a library? DC: Yeah, we live right next to the Grand Central Library in Brooklyn and I love it. But I will say that I have not borrowed as many books as I thought I would. DC: I think when I was younger, the library would be the only place that I could really get books like that library in Queens, or the school library, or Scholastic. I was much more inclined to go to the library, but I think working at Barnes and Noble made me realize how much I want to actually own books. GAL: Yeah, especially if you like going back to books you’ve already read. DC: Yeah, but every once in a while I'll find myself being like, “Okay, I'm gonna go on the library website, and I'm gonna put this book on hold, and I'm actually go physically get this book.” There is something beautiful about that, too. Going to the library, and picking up a book that has the plastic film over it. And then reading it, and then bringing it back, and getting another. I try to make sure I do that a few times a year. DC: It's a ritual, but it also brings me back to my childhood. GAL: Exactly. And there’s no financial commitment. I find myself choosing library books with wild abandon because of that. GAL: I’ll borrow cookbooks, gardening books, books about biology, things I would never ordinarily buy or buy recklessly. DC: That's a good idea. It's funny, I was just talking to a friend of mine about the ways that I find myself still giving myself these rules, arbitrary rules that we make up for ourselves that don't affect anyone else but us. GAL: We all do it in some capacity. I know, it's so weird. Go on. GAL: Abandon those rules! You could get a YA chapter book about cats if you want to! You’re a writer, right? DC: It's something I actually struggle with a lot. I find myself always, and I know this is a thing that writers go through, and anyone who's doing anything artistically go through, I have a lot of imposter syndrome. I'll get so anxious, which is a thing I'm working on. I get so anxious and I'll get so settled and weighed down by things that are happening in my life, whether it be politically or familial or just my general existential crisis which I have without fail once a month. GAL: I’m right there with you. GAL: Yes. It’s so hard. DC: “You haven't seen things in a while, but I am.” So it's just like being like, “Oh, say it, mean it, live it.” It is hard. GAL: Who's your favorite author? Or which are a few favorites, if naming just one is too difficult. DC: I would probably say Zadie Smith. I met her once and it was both the best and the most embarrassing experience ever. Her hand was so soft. I’m a weirdo. GAL: No way. Meeting an artist that has directly influenced your life in so many ways is intense and the world for those moments feels hyper real. Like the air goes out of the room and tiny details seem so large. How do you choose the books that you read? DC: There are bookstores all over the place that I really love getting recommendations from. My friend Nick, maybe 10 years ago, asked me what I wanted to do on my birthday. My birthday is October 21st, it's in the fall. I love the fall and walking around New York in the fall. I remember telling him all I wanted to do was peruse bookstores. We ended up hitting so many. There's one that I do not know that name of that is around the corner from the Angelica. And it is amazing. It's so small and New York is changing so fast all the time. And I feel like cultural institutions are just disappearing. GAL: Which other ones did you visit? DC: I love, love McNally Jackson. Unnameable Books is another one. GAL: We have a friend who has a sanity shelf which she puts books on that she returns to for pleasure, knowledge and solace. What books would be on your sanity shelf? DC: ****Oh wow, wow, wow, wow, wow. **** The Mandarins by Simone de Beauvoir. The Post-Birthday World by Lionel Shriver is amazing. I read it once every couple of years. There’s something about it that wonders what might happen if you have more than one choice in life that pulls me in every time. The Elena Ferrante series, too. When I read The Story of a Lost Child, I remember being like, “Oh wow. This is a relationship between two women that is complex and stunning and kind of eviscerating and lovely,” and it felt so real and alive. Claudia Rankine's Citizen: An American Lyric is another one. GAL: That one is on my to-read list right now. DC: Yeah. It’s definitely on my shelf because it just makes me feel seen. In this country, I mean, I feel like it's better now because it's a topic of conversation. However, I think it's still very hard for a person who is not a person of color to fully understand what it feels like when you find yourself in situations where you're being treated a certain way only because of the color of your skin. DC: It's probably something like, “Still Searching.” I feel like I'm always searching. GAL: I love that. It's beautiful. And a good reminder for all of us.